As I mentioned, multiple criminal charges may occur when a prosecutor is over zealous. Multiple charges give the prosecutor an unfair edge in the plea bargaining and jury process. Plea bargaining: A prosecutor has leverage during the plea bargain stage of a criminal case when a defendant has multiple criminal charges arising out of the same conduct. In a multiple charge scenario, a defendant may not want to risk fighting multiple criminal charges at trial. The prosecutor may offer to dismiss some of the charges upon a defendant pleading guilty to 1 or 2 of the offenses in a multi-charged complaint. Jury process: In addition, prosecutors have an advantage with juries in cases where multiple charges are pursued. The advantage is a psychological one where the jury feels that a defendant facing multiple criminal charges must have done something wrong to deserve it. Also, jurors may feel that they can satisfy both the prosecutor and defense by spitting the verdict and finding a defendant guilty of some of the charges while dismissing others. Example #1: Our firm represented a spouse charged with domestic violence, preventing use of telecommunications equipment, disorderly conduct and resisting/obstructing the police. Our client tried to leave the residence because of a heated argument with his wife. His wife blocked the doorway and he pushed her aside to leave the residence. The police report said that our client attempted to grab the phone from his wife when she first tried to call the police during the argument. He then left the residence but returned shortly thereafter while the police were present. The report stated that our client was loud and uncooperative when he tried to give his side of the story to the police. 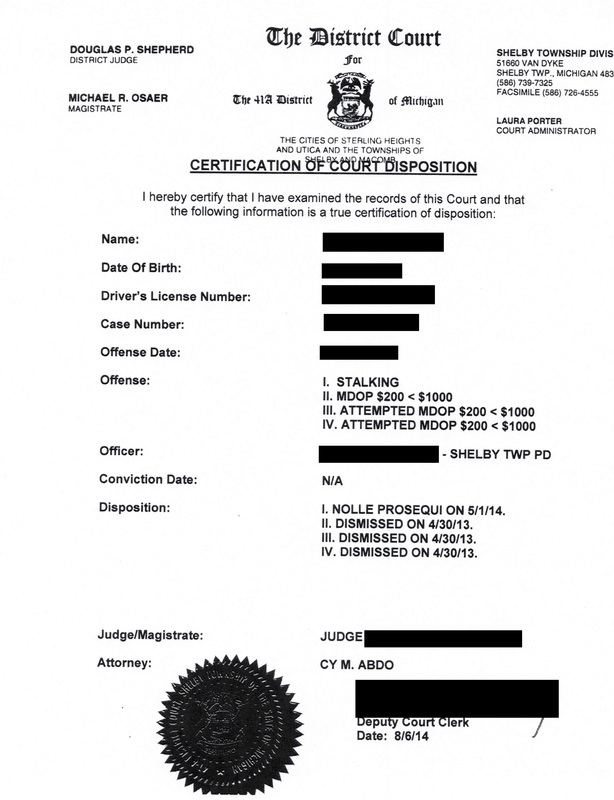 Our client did not have any prior record and was hardly someone we would qualify as a trouble maker or violent person. The above scenario (Example #1) is not uncommon. Improperly handled, the defendant may have wound up being convicted of several offenses (domestic violence, tampering with telecommunications equipment, disorderly conduct and resisting/obstructing police). That was not the case. Our job was to separate the wheat from the chaff. In other words, we were able to negotiate dismissal of several offenses (misdemeanors and felonies) which did not pertain to the underlying purpose of police intervention. The prosecutor and police both agreed that the person did not deserve multiple convictions. His wife was also helpful because she admitted that she was complicit and contributed to the physical contact when she obstructed her husband’s mobility as he attempted to vacate the residence. The final outcome was a plea to the offense of disorderly conduct which was taken under advisement pursuant to MCL 771.1 by the court and dismissed after one (1) year of good behavior. 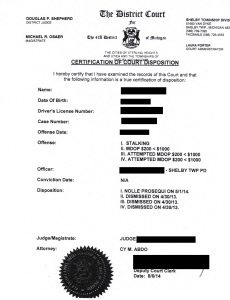 Example #2: Our client was pulled over for suspicion of drunk driving. He failed the field sobriety tests and tested positive for alcohol on the preliminary breath test (PBT). He was arrested. The police did an inventory of the vehicle and found a small quantity of marijuana and a “one-hitter” pipe. He had a suspended license because of an unpaid traffic ticket and did not have proof of insurance although the vehicle was insured. His charges consisted of drunk driving (OWI, .08% or greater), possession of marijuana, possession of narcotics paraphernalia, driving while license suspended and no proof of insurance. In this scenario (Example #2), we were able to have the no proof of insurance offense dropped because our client produced valid insurance at the pretrial conference. The driving while license suspended offense was also dropped because our client provided proof that he paid the ticket which resulted in his license suspension. Our client agreed to plea to a reduced charge of “impaired driving” and the offense of possession of marijuana was taken under advisement pursuant to MCL 333.7411 which was dismissed upon good conduct after 1 year. The offense of possession of narcotics paraphernalia was also dropped at the pretrial conference. We hope that this blog is useful to anyone facing multiple criminal charges. As I stated, a sound legal strategy and the ability to negotiate effectively can often lead to favorable results with minimal consequences. Knowing how to deal with the prosecutorial arm of government can mean getting a huge break without serious criminal convictions. Should you cooperate (snitch) with the police?